Many people say that my mom is lucky to have me as her son, an achiever, who, at an early age, is already able to provide for the needs of my family. But the truth is that I am luckier to have her. After all, I won’t be the person that I am right now if not for her. I owe everything to my nanay, and it’s payback time. When my father died (he was killed) when I was three years old, my mother has brought us up as a single mother. She worked as a sewer and with the meager amount she was earning, ensured that we were fed, clothed, and educated. She taught us the value of discipline and contentment. We learned to live within our means and to never get envious of what other people had that we didn’t. All she did for us paid off as we finished our studies and are now professionals. We give our nanay all the pampering that she deserves. 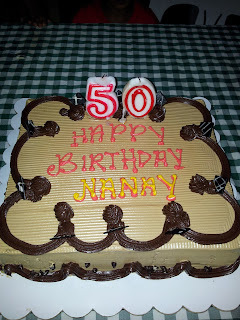 So on her 50th birthday last May 26, 2012, we ensured that it would be memorable. 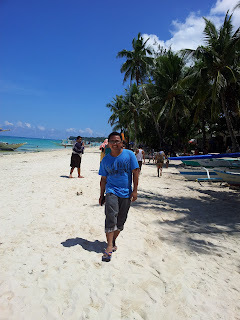 My initial plan was to bring her to Palawan, so I bought a 3D/2N Palawan Tour for 3 from Metrodeal. 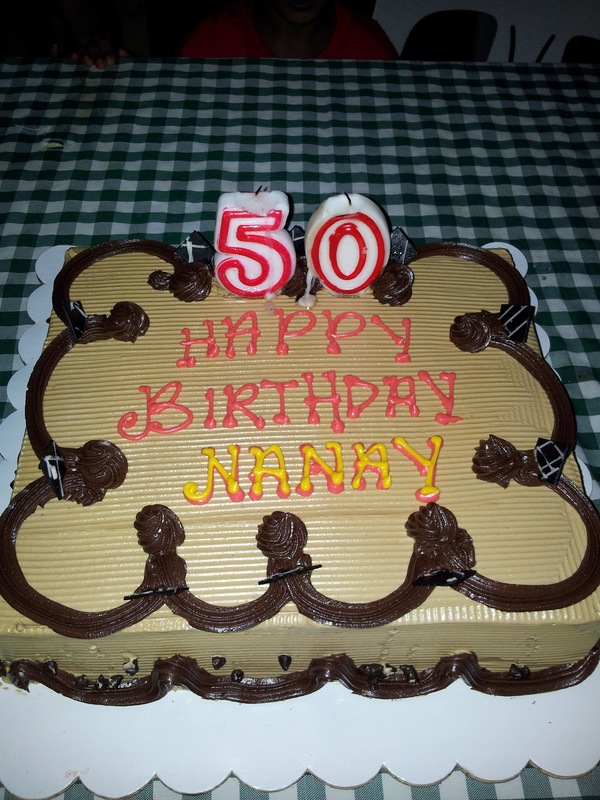 However, I realized that it would be better if we go back to Aklan, her place of birth, and celebrate her golden year with our relatives. 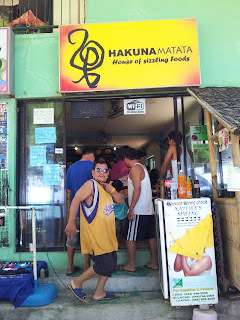 And what is the better place in Aklan to celebrate this than in Boracay? 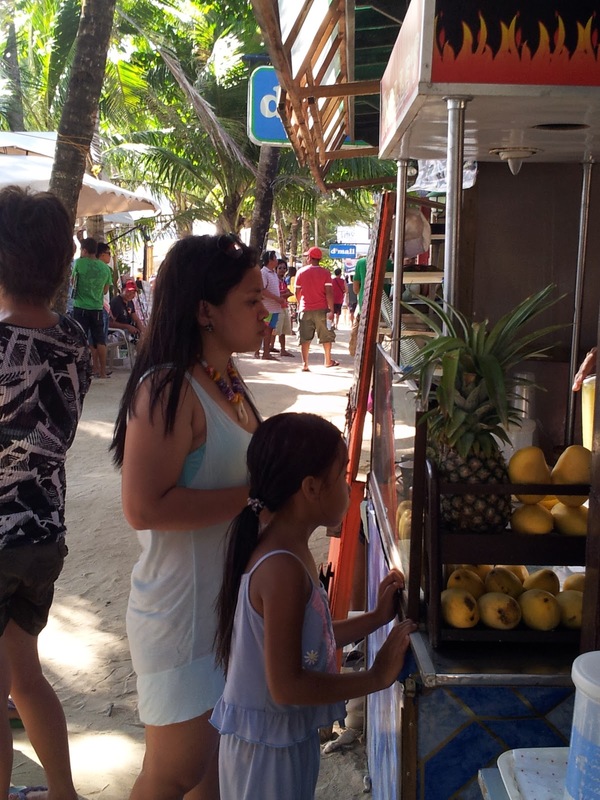 This Boracay celebration was not only a gift to her, but to my relatives as well, because, although they reside in Aklan, most of them have grown up not experiencing the beauty of the place, the pride of the province. I was the one who provided the financing for all our expenses, but it was my sister who did an excellent job in organizing the event. She did the budgeting, the booking of airfare and accommodation, arranging of the transportation, and planning of the activities that we would do. 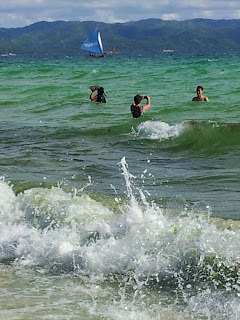 This chronicles our memorable 6-day stay in Aklan. We left Manila thru ZestAir at 6:10pm. I was with nanay, my sister, and her boyfriend. 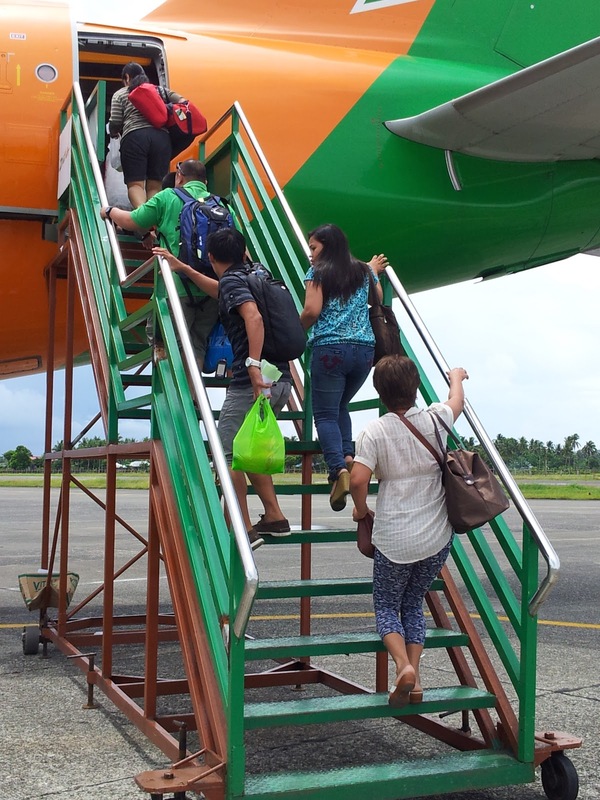 It was their first time to board on a plane, and they were amazed about the speed of going from Manila to Aklan. The last time we went to Aklan was in December 2011 and we got there on board a ship that traversed the heavily undulating sea. Of course, 45-minute flight was far better than a nauseating 16-hour sail. My cousin and her husband fetched us from Kalibo International Airport and we’re able to reach my auntie’s house in Banga in less than 20 minutes. We unpacked and prepared for the next day’s chores. 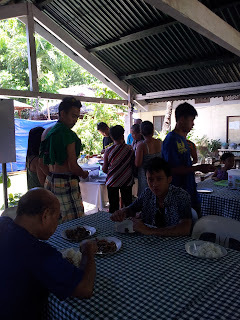 Our relatives from Madalag came over and helped in the preparation of the food that we would be bringing to Boracay the next day. All of my nanay’s sisters – Auntie Marita, Auntie Linda, Auntie Nita – were there. Sadly, his only living brother was not able to come because of some errands that he had to do. Auntie Deling, wife of my mom’s late eldest sibling, was there. My cousins who were present were Nong Michael and his wife, Linda, Nang Ging-Ging, Donnie and his girlfriend, Joan (Auntie Marita’s side); Nong Jun-Jun (Auntie Linda); Nang Cheryl and his hubby, Filamer, with their kids, Bok-Bok and Tinoy (Auntie Nita and Uncle Onoy); and, Nong Bernon and his wife, Nang Janice with their little girl, Bebe, Bernie, Dodoy, and Din-Din (Uncle Junior). Auntie Marita brought with them a naughty, little boy named Bebe. Nanay and Auntie Nita went to Kalibo market to buy pork, chicken, and other ingredients for adobo, sweet and sour, and afritada. Auntie Linda, Auntie Marita and Nang Ging-Ging prepared the buko salad. Uncle Onoy who was a superb master of the kitchen, cooked the dishes early morning of the next day. In the evening, the “eve” of my nanay’s birthday, we conducted parlor games which were eagerly participated in by my aunts and cousins. We had banana-matchstick race where one needed to push the matchstick with a banana hanging from his waist. We also had banana eating contest where a member of a pair needed to have two bananas eaten by the other member. We had a raffle where the food containers and banana boat ride experience the next day were the prizes. Game 1: Banana-Matchstick Race: My cousin Dodoy (leftmost) won. Game 2: Banana Eating Contest. The newly weds (Nong Michael and Nang Linda) won. Storage Box: Raffle Draw Grand Prize won by Auntie Marita (2nd from right). Everyone was happy and excited for the next day. 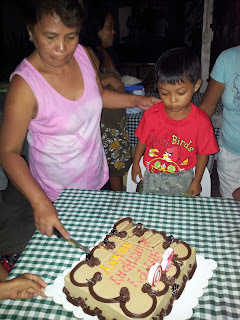 This day was my nanay’s birthday. Everything was prepared and we left Banga at exactly 9am. We rented a jeepney that transported us to Caticlan for two hours. I saw the excitement in everyone’s face and that made me happy. We were giving them the experience that they would take with them forever. We saved expenses for environmental fees because we're "residents" of Aklan (except for Ferdie and Joan who paid the said fees). 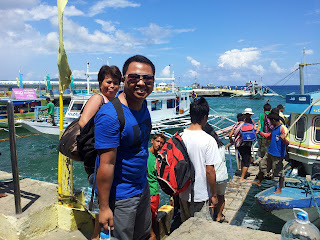 We rode the ferry boat from Caticlan to Boracay. We rode a tricycle going to Station 3 where A-Rock Resort was located. 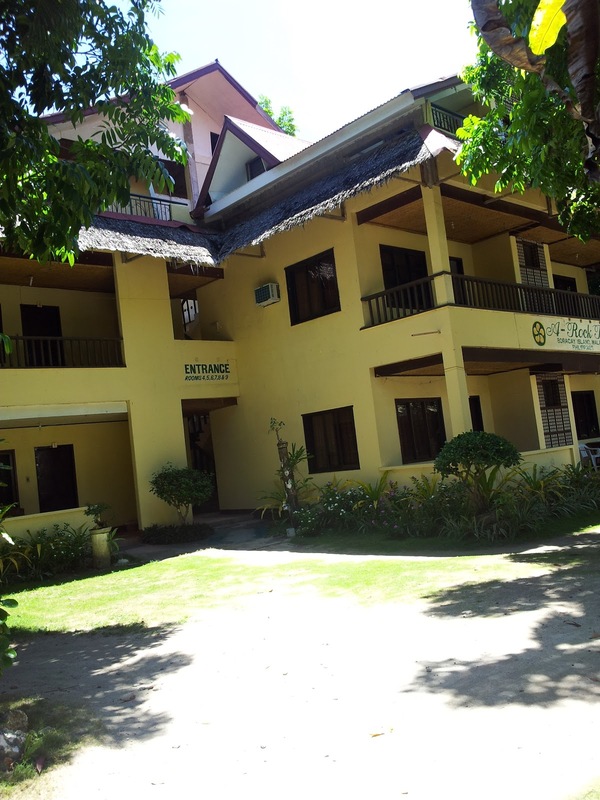 We reserved four airconditioned rooms that could accommodate six persons each. We divided the rooms per family. It was our second time in A-Rock (the first being in December 2011) and we returned to the place because of its cleanliness and affordability. Each room was priced at P2, 500 overnight. 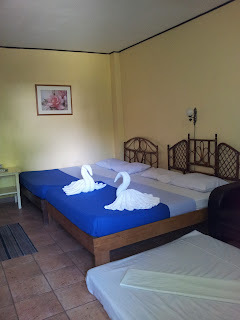 Rooms had comfortable beds, TV with cable channels, and spacious comfort room. A common area for dining was available. Wi-Fi was available and they had a small convenience store inside. A-Rock is just two-minute walk from the beach. A-Rock air-conditioned room. I love the swan towels! After we unpacked our things, we had our lunch at the common dining area. 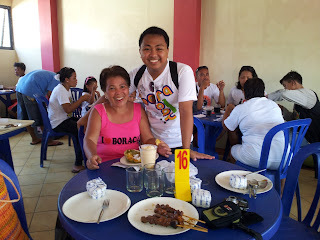 We had sumptuous dishes that included adobo, sweet and sour pork, and afritada. We also brought the frozen buko salad that we prepared the other day. 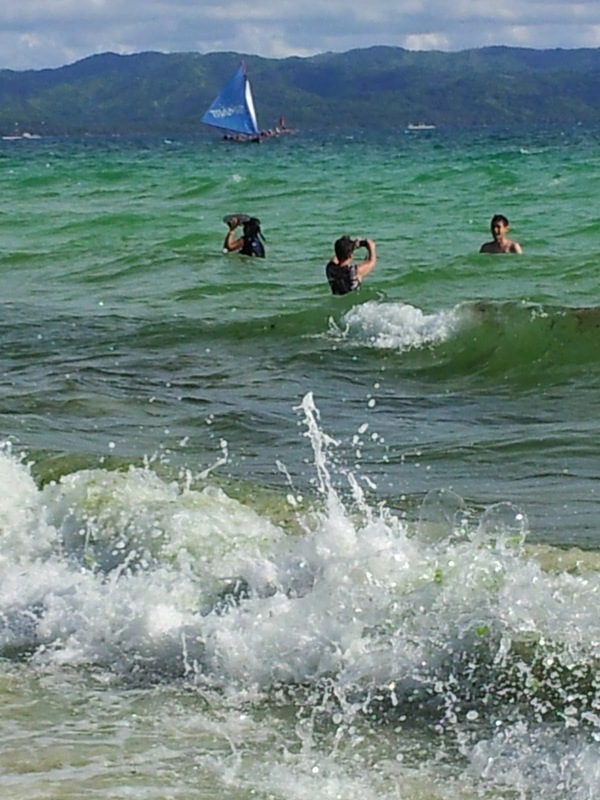 We rested for an hour and looked for people who were offering banana boat rides. 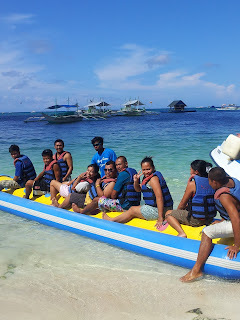 May negotiated to lower the cost of banana boat ride from P250 (rate published in the Internet) to P170. Because of this, all of the adults, except for my Auntie Linda, were able to experience the exciting ride! 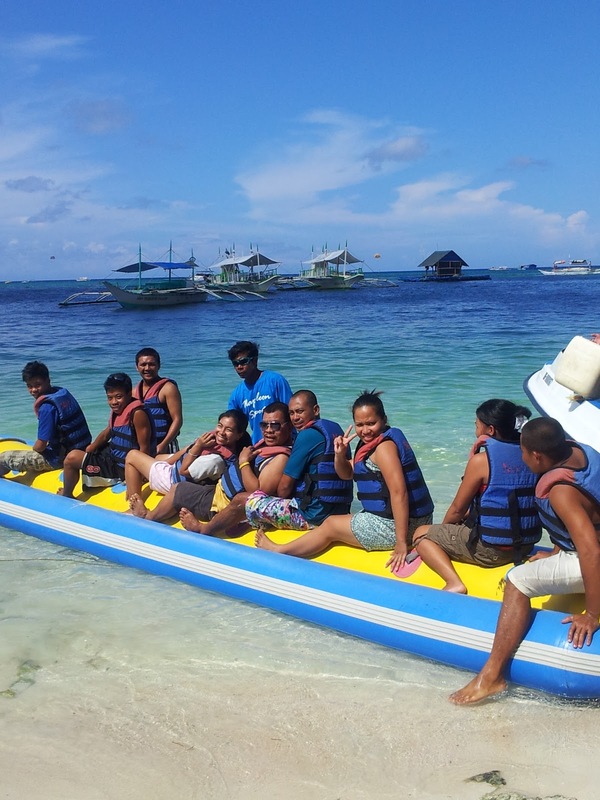 The exhilirating Banana Boat Ride! We were transported to Station 1 for the banana boat ride. We donned our life vests and got ready to have the inflated “banana” be pulled by a motor boat. Everyone of us was screaming in exhilaration! The adventure lasted for 15 minutes. 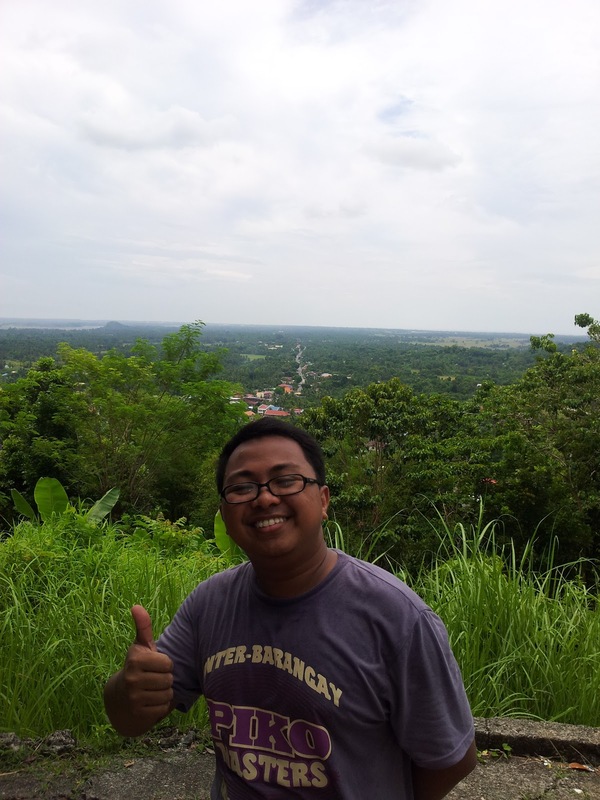 After this, we were transported by a shuttle service to D’Mall for free. We started strolling and swimming from time to time. Sun, Sea, Sand, and Surf! We rested and had refreshing halo-halo and shakes in one of the small restos along the commercial strip to quench our thirst. We returned to our hotel at around 5pm. After bathing, May, Ferdie and myself went to D’Mall to buy cake and candles. The cheapest cake that we found was at Bread and Butter, however, they didn’t have candles. What is a birthday cake without a candle to blow? We found a pastry shop inside the mall that offered cake with candle, but the problem was, it was very costly! 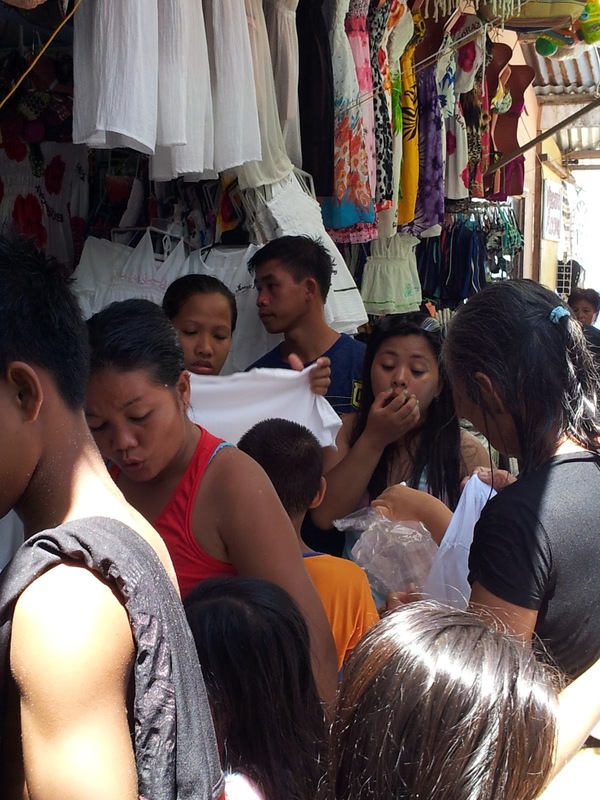 Good thing, a souvenir vendor told us to go to Francelline, a school supplies store. To our surprise, they were selling birthday candles! We bought number candles, 5 and 0 (50). At D'Mall, while looking for a birthday cake with candle. We had our dinner when we came back and after the dinner, we brought out the cake, sang “Happy Birthday To You!”, and shared the cake among ourselves. My mom as she slices the cake. The boy in red is my nephew. He wants the cake, obviously. 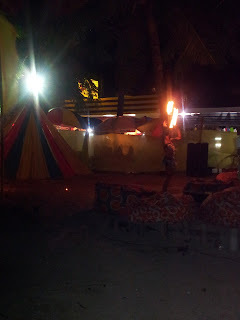 We spent the rest of the evening strolling along the shoreline and watching the performance of the talented Boracay Firedancers. My cousins celebrated by drinking liquor until 2am. With the Boracay Firedancers as my background. 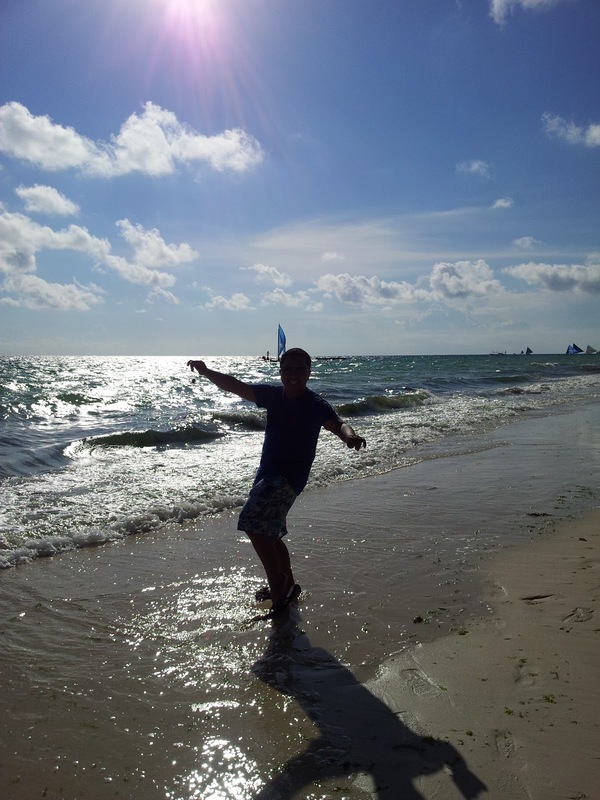 May, Ferdie, and Uncle Onoy woke up early to see the sunrise and feel the morning breeze while strolling along the powdery shore of Boracay. I woke up at 7am. 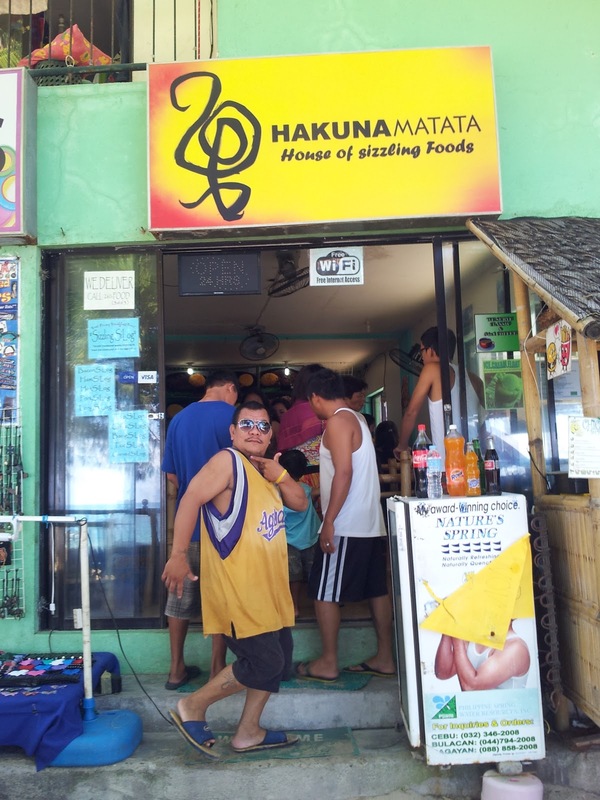 We had our “silog” breakfast and coffee at Hakuna Matata, a tapsi house in Station 3. 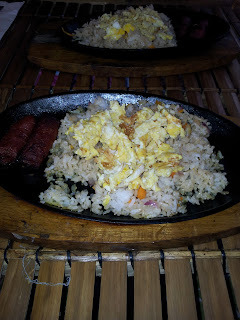 The place served affordable selection of “silog” truly apt for breakfast! 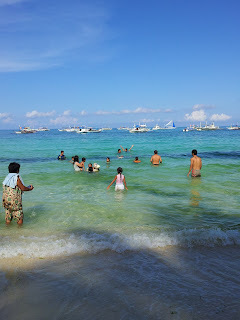 After having our morning meal, we again, dipped into the pristine waters of Boracay! 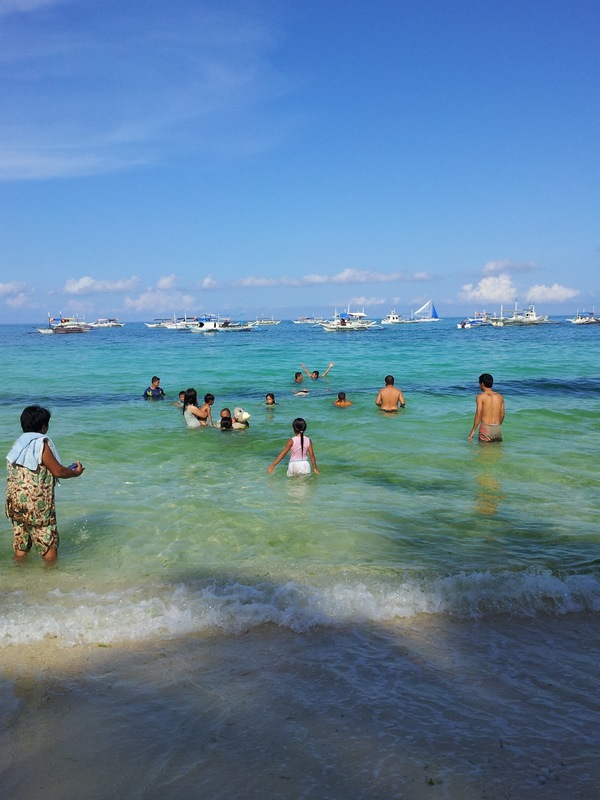 We enjoyed swimming and chasing each other under the hot kisses of the sun. We finished swimming at 1030am. Swimming in the morning is the best! 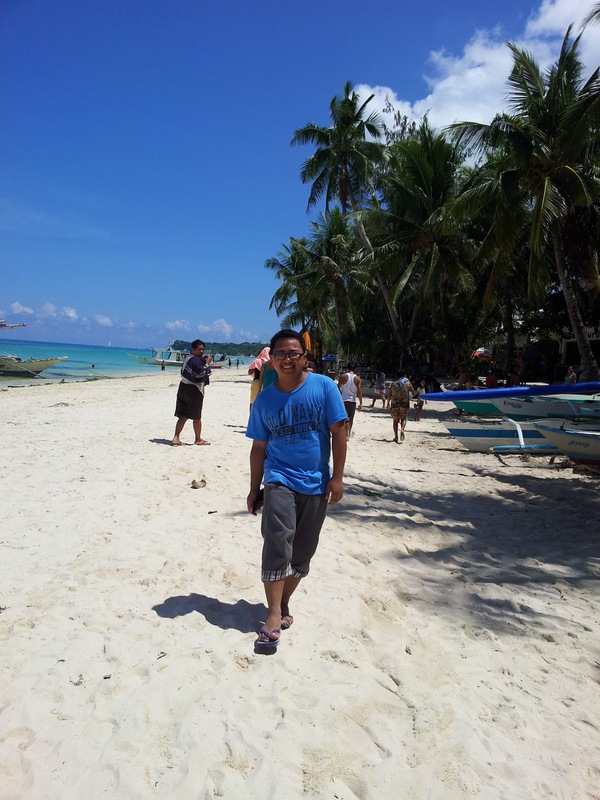 Walking (and posing) by the beach! 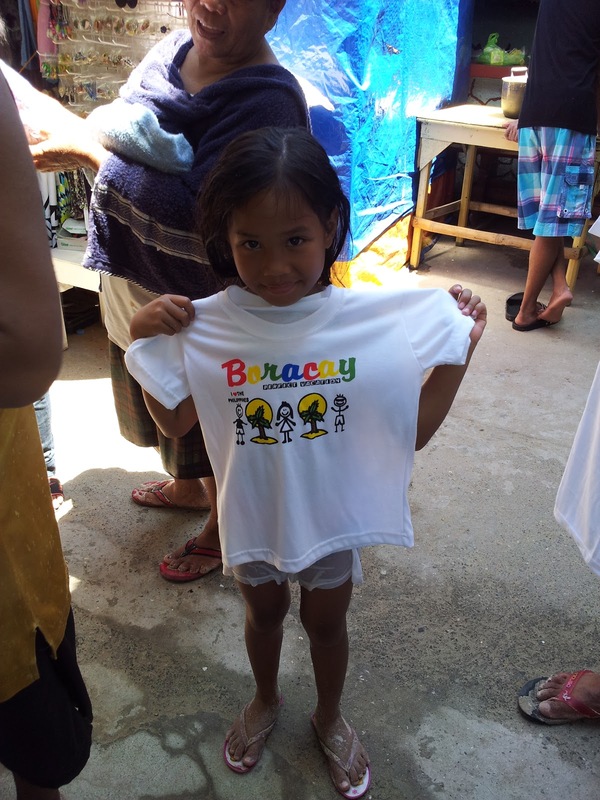 After swimming, we went directly to a souvenir house selling t-shirts. We asked everyone to select shirts or sandos for themselves which they would wear going home. We also bought shirts to those who were not able to come with us, like my Uncle Junior and his wife, Auntie Leny. Shopping for shirts and sandos! One of my nieces shows her shirt. We returned to A-Rock at 11am and hurriedly took shower and prepared our things as we needed to check out at exactly 12nn! We’re able to leave the hotel at 12nn and headed to the nearby Andok’s Chicken to have our lunch. Wacky shot of my family! Truly, our stay in Boracay, even if it was short, was still fun! During lunch, we announced that they should not be going home to Madalag yet because in the evening, we would be celebrating May’s 23rd birthday (her birthday is on May 28). This meant another “party,party’! We took the same route going home, riding inside the same jeepney. May, Ferdie , and I alighted in Kalibo and we bought ingredients for spaghetti. We also bought ice cream and props for the games. When we got home, we set up our Wow! Magic Sing Videoke and sang our hearts out until the food was ready. After we wolfed down the spaghetti and ice cream, we conducted games where the prizes were P20 bills! Despite the seemingly low amount, everyone was competitive! We had banana eating contest where the girl partner needed to eat the banana hanging from the waist of the male partner. We also had water transfer relay where each member of the team of five had to transfer the water in his cup into the cup of the next member. Whoever had more water after the final cup was filled in would win. Finally, we had eating relay where each member of a group of three should eat different food at each stage – banana on stage 1, chips on stage 2, and Yakee!, a sour bubble gum, on stage 3. The bubble gum had to be blown. Whoever blew the bubble gum first would be declared the winner. 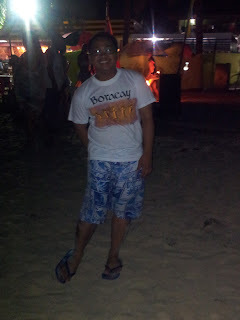 The rest of the night was spent sharing stories of what happened in Boracay and the previous nights. My relatives returned to Madalag early in the morning. 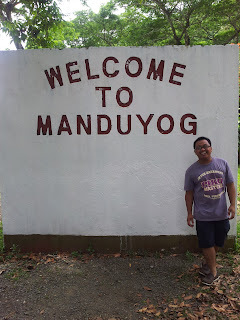 We spent the morning of May’s birthday in Manduyog Hill located inside Aklan State University. 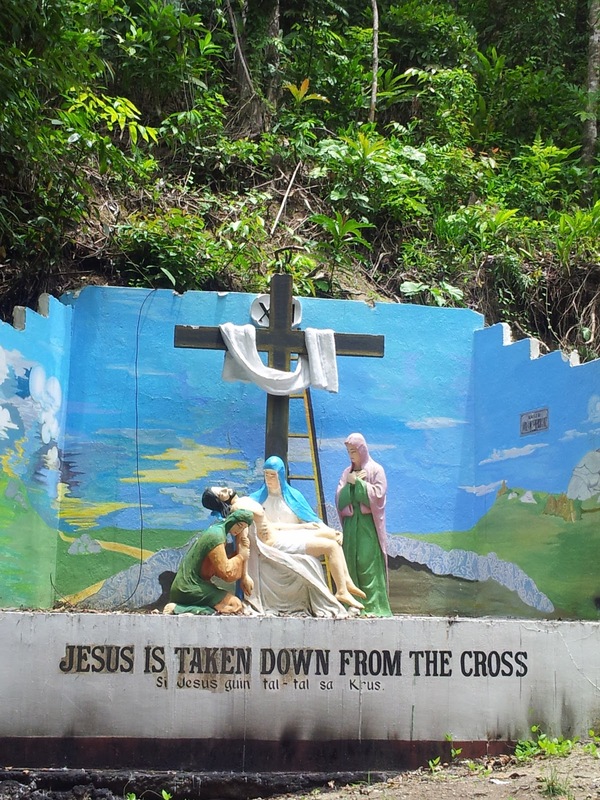 Manduyog has been frequented by guests especially during Holy Week because of the Station Of The Cross, depicted by sculptures installed from the foot of the hill up. 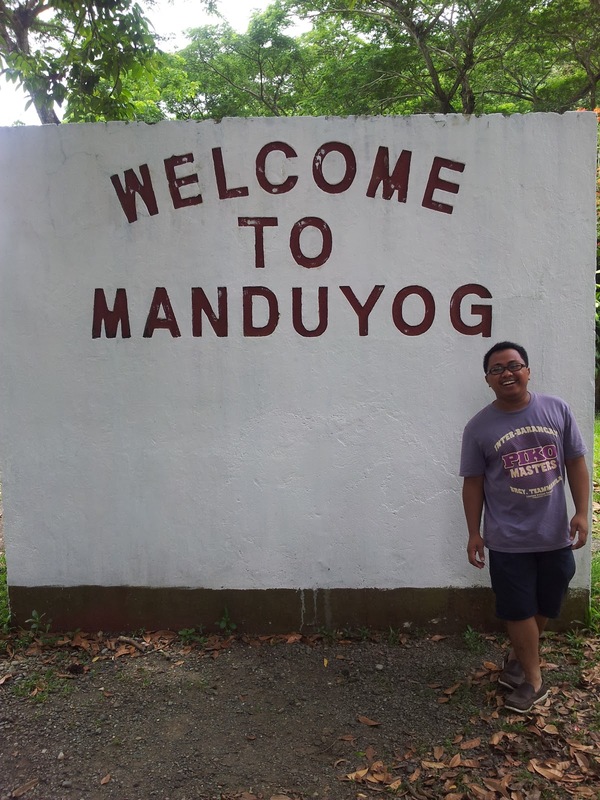 Manduyog has maintained its charm from the last time I climbed up on it 20 years ago. The sculptures needed to be enhanced, though. Atop the hill stood a cross and from top, an amazing view awaited us. 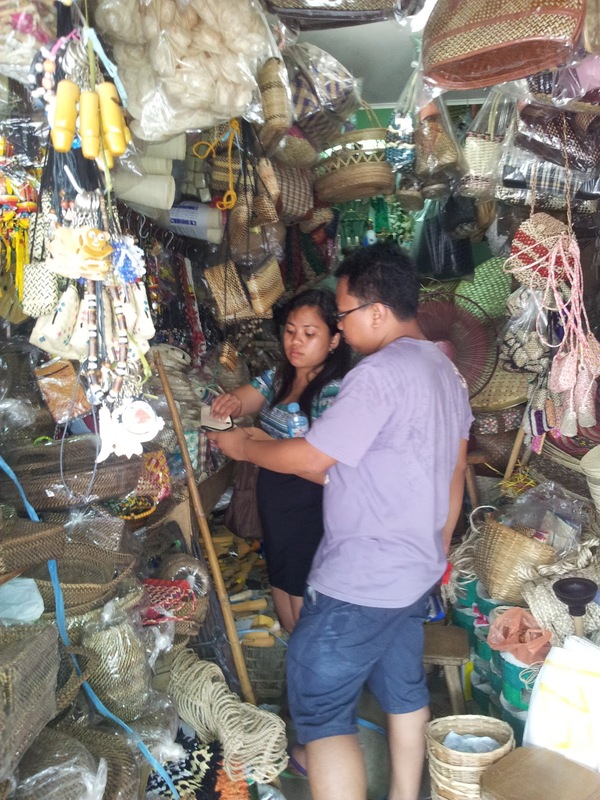 After climbing the Manduyog Hill, we went to Kalibo to buy souvenirs and pasalubong. May bought bags for her co-teachers while I bought keychains for the children of my officemates. I also bought 24 packs of piaya as pasalubong for my officemates. At night, we prepared all our stuff and prepared for leaving the next day. We said goodbye to my aunties and promised to return when we have time soon. Our flight was scheduled at 11:30am. We were at the airport at 9:30am and waited for our turn to get on board. 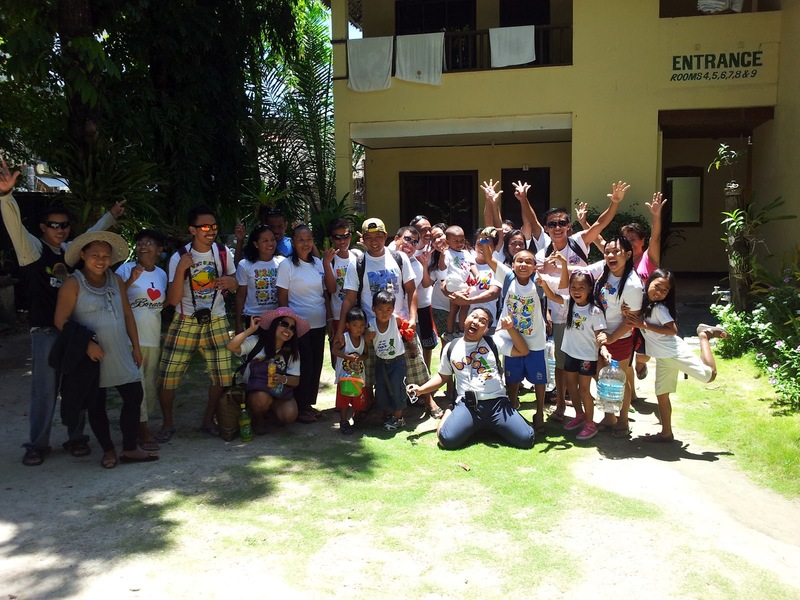 We bid farewell to Aklan and reached Manila an hour after. Leaving for Manila. See you soon, Aklan! Whenever I want to remember the experience, I just look into the photos and videos saved in my phone. I am very happy with the experience and I know, in my heart, that my nanay is, too.